The “Ultimate Revenge Diet” is a weight loss program that is primarily targeted to women. We obtained a copy of the program to see investigate it's actually an effective diet, or just hype. This review will cover what’s inside and tell you whether it’s worth your time. It’s all based on what happened to Joanie Anderson (not her real name). After her husband left her for another (younger) woman, she decided to lose 40 pounds. It wasn’t easy because she was in her 40’s, also a mom of 3 and worked full time. But she managed to do it without diet pills or insane amounts of exercise. It's as they say: revenge is the best diet. And that’s what inspired the Ultimate Revenge Diet. You've probably heard this type of story before. But then the diet turns out to be nothing special. 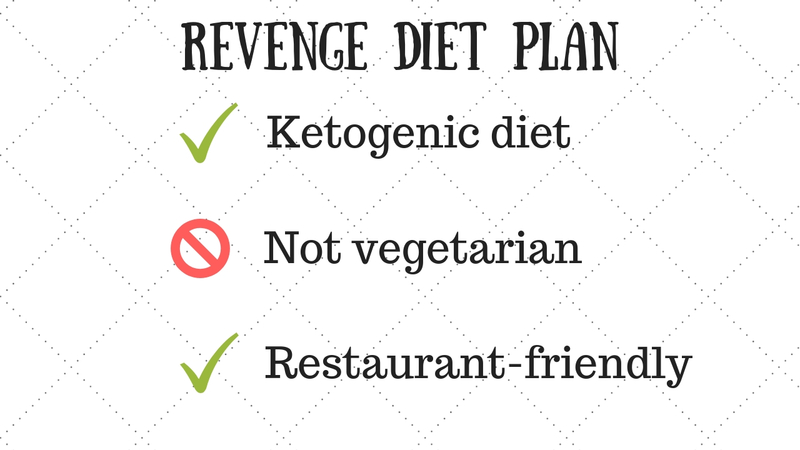 The Ultimate Revenge Diet is based on the popular ketogenic (“keto”) diet. If you're not familiar, the keto diet restricts your carbohydrate intake, while letting you eat plenty of protein, fats, and vegetables. This causes your body to start burning fat as fuel, instead of carbs. You end up burning fat while still having energy, and you can eat until you're full. For example, a hearty salad with egg and bacon and nuts would be okay to eat during a keto diet. As long as you hold the croutons and sugary dressing. But be aware: it's not as easy as it might sound. Your body gets used to consuming lots of carbs. And so cutting down on carbs makes for a difficult adjustment period. This is something Ultimate Revenge Diet prepares you for. Joanie explains that the first seven days are especially difficult because your body is adjusting. So the first part of this program tells you exactly what to eat during the first week in order to get through it successfully. You'll get a grocery list for that week. And then recipes for each meal and snack of that week. The meals are heavy in protein: beef, lamb, eggs, bacon, and chicken are used a lot. It's usually one or two of these proteins made with a salad and herbs and spices. They also use healthy fats in these meals and snacks: avocado, macadamia nuts, healthy oils. The recipes aren't too complicated or time-consuming. Cooking the meat will take the longest. It looks like most of these meals could be ready within a half hour or so. Also, the 7 day jumpstart has an exercise that has you examine your relationship with food. Joanie probably realizes that changing this relationship into something positive and empowering will go a long way toward sustaining your weight loss long term. The bulk of the program is here in the 6 Week Revenge Diet ebook. Instead of giving you specific meals for each and every day, you get guidelines for how to eat each week. And each week you need to adjust how much protein, fat and carbs you eat. These ratios are based on Joanie's research about ketogenic dieting. For example: during week 4, you will actually be cutting back on eating fats and eating more greens, so that you can let your body burn the fat you already have. Now, there are suggested meals and grocery items for each week, so you won't be left guessing. But you're allowed to be flexible here. Just try to follow the guidelines. There's also a list of supplements to take during the diet. These are common and safe supplements you can buy at the store (like fish oil, for example). Since this is a keto-based diet, you might assume there's no dessert. But you actually have plenty of chances to get your sweet fix. Obviously the desserts won't use all the sugar and flour that you're probably used to. These recipes use things like stevia and cocoa powder to add the necessary sweetness. There are also breakfasts that have a sweeter flavor. For example, there's a morning smoothie called the “Chocolate Fudge Shake”. Sounds like a sugar bomb, but it actually only uses a few healthy ingredients. You've probably already heard about apple cider vinegar for weight loss. It's becoming incredibly popular, and for good reason. Research has shown that it works for weight loss and regulating blood sugar. So we weren't surprised to see apple cider vinegar recommended in Ultimate Revenge Diet. She actually gives you a recipe for an interesting morning drink called the “Morning Start”, which uses apple cider vinegar and few other ingredients. It's meant to help you digest and keep burning fat. And the research seems to support it. This program emphasizes the need to start your day off right. That means consuming the right things, and doing a bit of exercise. We already mentioned the apple cider vinegar drink. She also has a coffee + oil + butter recipe that's similar to the popular “bulletproof coffee”. The idea here is that adding healthy fats to your morning coffee gives you more fuel than just caffeine alone. We have not investigated those claims, but many people seem to swear by it. She also gives you a simple set of yoga moves to do each morning. The goal isn't to torch fat – that's supposed to happen through your diet. Rather, it's all about getting your body moving and digesting. We all know how important a good morning routine is. So this aspect of the program is a real plus. Dieting For Women: Is It Different? As you've probably realized, Ultimate Revenge Diet is primarily meant for women. With that in mind, there is an additional book that covers some important concepts about dieting as a woman. Ketogenic Diets: What's The Evidence? Given that this program is based on keto diet principles, we want to know whether ketogenic diets actually help you lose weight. Here's the concept: Your body burns carbohydrates as fuel. If there aren't enough carbs coming in, though, the body starts to burn fat as fuel instead. So if you eat a lot of carbs, your body will just keep using that as a fuel source. And whatever you don't use gets stored as fat. But if you greatly decrease the amount of carbs you eat, and add more protein and healthy fats, you will start burning the fat you eat, as well as the fat on your body. Ketogenic diets, like most low carb diets, work through the elimination of glucose. Because most folks live on a high carb diet, our bodies normally run on glucose (or sugar) for energy. We cannot make glucose and only have about 24 hours’ worth stored in our muscle tissue and liver. Once glucose is no longer available from food sources, we begin to burn stored fat instead, or fat from our diets. Therefore, when you’re following a ketogenic diet, your body is burning fat for energy rather than carbohydrates, so in the process most people lose weight and excess body fat rapidly, even when consuming lots of fat and adequate calories through their diet. Another major benefit of the keto diet is that there’s no need to count calories, feel hungry or attempt to burn loads of calories through hours of intense exercise. The answer seems to be that ketogenic diets work. Harvard Health wrote about this in their blog, and concluded that ketogenic diets can indeed help accelerate weight loss. One caveat, though, is that keto diets can be difficult to sustain over time. Eating lots of meat isn't for everybody. In our opinion, having a proven system to follow can make it much easier. We've already covered a lot of the things we like about this diet. But let's summarize here. Even though it has a lot of great features, Ultimate Revenge Diet isn't going to be for everyone. Here are some of the drawbacks. Not meant for rapid “overnight” weight loss. You lose pounds over the course of weeks, not days. We've covered what's in the diet, and who it's best for. It's well-written and everything is laid out for you. And it's based on a proven concept – the ketogenic diet. If you feel like you're banging your head against the wall trying other diets, and you're willing to give something different a try… then we strongly recommend the Ultimate Revenge Diet. And since there is a 60-day guarantee, you can try it now to see if you like it. Go to >>www.ultimaterevengediet.com<< to check it out.